Give the Gift They are Sure to Love. A Village Clubs Spa Gift Card is the Perfect Way to Show How Much You Care. Share the Gift of Wellness Two Ways. 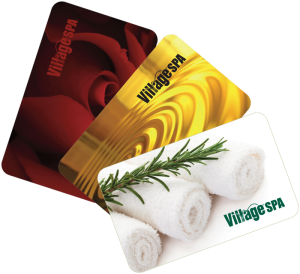 Village Clubs Gift Cards can be purchased in person at the Spa desk or digitally. In Person: Your Village Spa gift card will come wrapped for a beautiful presentation with elegant print and textured card holder, giving your recipient a taste for what awaits them at their Village Clubs Spa experience. Digitally: Sending a gift card has never been easier! Simply select the amount to add to the gift card, select your recipient, add a personal message and a gift delivery date, and we’ll send a gift card straight to their email inbox. You can purchase gift cards for any dollar amount in person, or between $5 – $250 digitally.